Brilliantly repackaged with bolder and brighter colors, the XO line of AVO hand-rolled premium cigars have become another masterpiece produced by legendary cigar connoisseur and musical legend Avo Uvezian. These premium cigars are remarkably smooth, yet richly complex, constructed with a perfectly-aged Ecuadorian Connecticut-seed wrapper, infused with a special blend of fermented Dominican binders and long-fillers. Amongst the cigar community, AVO has established itself as a well-respected premium cigar brand, with the AVO XO line being no exception. Every style listed below in our online cigar store is a medium-bodied composition that is perfectly-balanced, offering a savory and ultra-smooth smoke, flawless to the end with a perfect burn. 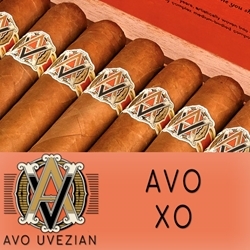 AVO XO are hand-rolled premium cigars that make an excellent choice for any cigar connoisseur. Smokers Discounts has made it easy and affordable to buy cigars online. A variety of sizes and flavors are listed below. Each of these styles are in stock and available at a low discount price. Call us for more details!